We chatted with Chris Oye, Methods and Procedures Analyst, Premier Support Solutions, who has seen various sides of the business since starting his Asurion journey with us four years ago in Nashville. Since his first role as a Customer Support Technician, he has made noteworthy career progression and we’re excited to share his story, firsthand. Asurion Careers: Tell us about your progression with Asurion! What interested you in your various roles? 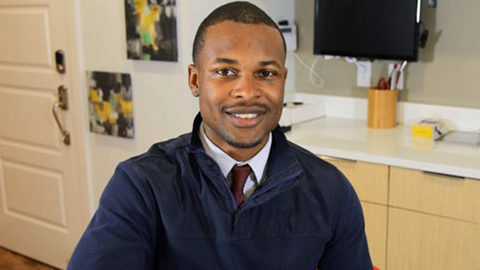 Chris Oye: Following my first role as a Customer Support Tech, I also served as a Board of Trustee & Residency Mentor. This allowed me to contribute and partner with the Business & Operations Management teams to deliver service to our technicians and innovate the content, training, and culture experience. Shortly after, I was promoted to a Technical Writer in January 2014 and also served as an interim Customer Solutions Specialist for our Business Operations & Innovation team, focused on growth and innovation. CO: I read up on what’s happening in our technician’s world through data, analytic, and social channels to strategize and determine how to prioritize work for the day, in order to bring the most value to our technicians and customers. CO: Our creative culture and being able to work closely with individuals who have a strong passion to deliver service excellence and provide innovative ways to reshape the industry standards we know today keeps me going! AC: What are some standout opportunities you’ve participated in? CO: Being able to work with our futurist teams to evolve the way we deliver knowledge through an advanced virtual assistance technology that was built in-house. I also had the opportunity to travel and work in Phoenix in 2013 to help stand up our first remote site for Soluto, our Premier Support Services. CO: Being able to work in a collaborative environment where everyone is working together to spark innovative ideas to make customers lives happier with their technology. AC: If you could buy any piece of technology or device, what would it be? CO: That’s easy. I would buy a Tesla! Our thanks to Chris for sharing his career at Asurion!